The third marketing condition you need for your school to grow is a solid education brand promise. Are you making and keeping yours? Education marketing is built on promises. What does your college, university, or school promise to give your prospective student in exchange for their time, interest, tuition, social media share, email, etc.? Marketing is built on promises because you’re communicating with a prospective audience about a transaction that hasn’t occurred yet. The exchange of value is still off in the future. When you examine every marketing message, you’ll find that you are making a lot of promises. What you will do… when you will do it… how you will go about it… whom the student will become. But when we talk about an education brand promise, we’re talking about the central promise that you need your prospective student to hear loud and clear. An education brand promise is a pledge you make in your marketing about the primary benefit prospective students will receive from attending your school. One of your primary objectives as a marketer is to get your education brand promise to shine through and tantalize your audience in every message you send out. Another way to think of an education brand promise is staking your claim. Make a bold, nerve-rackingly explicit claim. What is it that you do or provide that is the absolute best in your geographic area, expertise, or class? Marketing guru Seth Godin emphasizes that being the best at something doesn’t mean being the best in the whole, wide world. “Being the best” is relative. Best in the world just refers to the world of the consumer in that moment, and best means the thing that most appropriately fits his worldview. In other words, I don’t think you have to be the best in the world at classical violin. I think you can do great by making the best espresso on this particular block of downtown Chicago, or being the politician with the best stance on immigration (the one I agree with the most). Your education brand promise should be so bold and clear that everyone will know if you achieved or failed at delivering it. Compromise is the enemy of that. So is fear. So is the desire to fit in or be average. The key is to know your school so well that you could make the claim of being the best at something without any fear that you won’t deliver on your promise. The biggest mistake schools make when staking out their education brand promise is making a promise that’s contrived, or worse yet, ripped off from another school. Promises that don’t come from what your institution just does organically (i.e., your mission) are promises you will most likely break. Social psychologist Dr. Heidi Grant Halvorson revealed in a Huffington Post article the small difference between the promises we break and the ones we keep. Earlier in the article, she gave the example of how a friend offered to babysit her children so she could get away and take a break. Will that friend ever come through and watch the kids? Heck, no! Her friend’s promise did not come from an authentic desire to be with the kids. Dr. Halvorson’s well-intentioned friend was just making the promise because she wanted to feel like a good friend. An education brand promise is like promising to watch children. Are you doing it because you want to? That would be a promise she would keep! Why? Because it’s a promise to do something that she already likes to do. Being with the kids was “desirable for its own sake.” It’s not about a contrived version of herself that she wants to project (like being a good friend when she’s really not). What things does your school do that you do simply because they are a natural extension of who you are? So how do you know what would be desirable for its own sake for your school? Check out my previous posts on brand authenticity and brand authority. To wrap it up, I wanted to leave you with a few education brand promise examples that I believe these private schools do well at. Does Indiana Wesleyan University have world-class faculty? Yes. Do they have top-of-the-line equipment on their campus? Sure. But those things aren’t the primary benefit a student would receive if they graduated from IWU. That’s a really, really scary promise to make to over 1,500 students every semester! What makes Keystone’s promise so compelling is that upon graduation you know if it was kept or not. No guessing. No ambiguity. Making and keeping your brand promise is an ongoing, and sometimes intense, process. In real life, we need trusted voices who help us make the right promises — and who help us keep them! 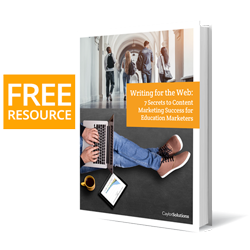 If you need a trusted guide to help you clarify your education brand positioning, or to completely rebrand your institution, you don’t have to go it alone. Feel free to reach out to us for a free consultation. What promises are you making? What does your school do better than anyone else in your region, field, or program-type? What are the things you do just because your institute is passionate about them?